Portraits of great wildfires from ex–Chicago Tribune reporter Maclean (Fire on the Mountain, 1999). The 1953 Rattlesnake fire in northern California was the result of arson, which gives the author a chance to explore the motives of the arsonist (in this case banal, more the province of an anger-management specialist than a smokejumper) as well as the physiography of the fire: how it raced downhill, trumping the wisdom of firefighting lore, the willful winds resulting in a terrible blowup, “a swift, thunderous event engulfing everything in its path in a tidal wave of white-hot fire.” Maclean’s phrasing seems unnecessarily overwrought compared with the simple fact that 15 firefighters died as a consequence of the fire's erratic behavior; also uncomfortably mismatched are the bullying tactics of the arson investigators and the instability of the man accused of igniting the fire. The author depicts the emotional undertow of death, along with the inexorability of a fire gone wild: “When water hit the flames, puffs of white smoke shot upward. Then a new spot fire would sparkle into being a few yards away.” The second blaze, which erupted in 1999 in northern Nevada, demonstrates the dangers of not immediately jumping on a fire when suppression is the tactic of choice, a topic that segues neatly into chapters on the evolution of firefighting policy in the Forest Service. 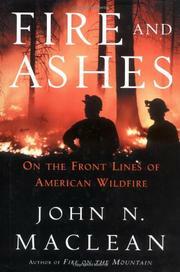 In addition, Maclean notes the folly of hubris in the face of wildfire, the administrative snafus that can result in entrapment of firefighters, the pure miracle of escape (“The nugget of flame churned at the mouth of the gulch, then unexpectedly sped away”), even the value of a personal prayer. “Mommy, help me! I'm burning!” was the radio call of one fighter. She lived, happy to face down the jibes.